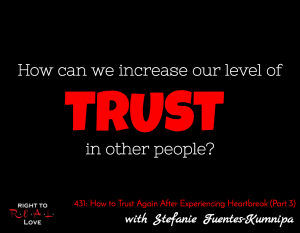 In this episode, Jay concludes his discussion with life coach Stefanie Fuentes-Kumnipa by addressing the question: How can we increase our level of trust in other people? How can we increase our level of trust in other people? The importance in us working through our pain. Steps to increase our level of trust. The void many people experience in their lives. The value in fulfilling our purpose and serving others. You must acknowledge your pain. It is the only way to heal. Take the necessary steps to address your pain. Write down where your pain is coming from and how it is impacting your life.